I’ve been doing a bit of thinking about how the Brexit and Trump campaigns were so successful. 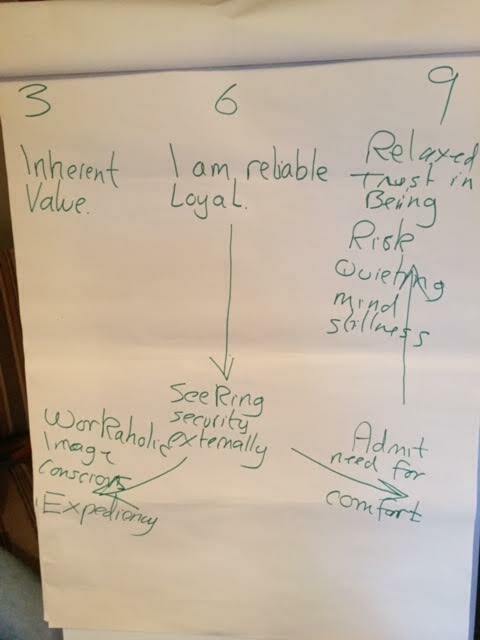 (I owe most of ths thought process to a very inspiring session about our shadow selves from Paul and Angie Woods, during a weekend focussed on the Enneagram). What was it, apart from the arguments made and the general feeling of discontent that appealed so deeply to the national psyches of the United Kingdom and the United States respectively? 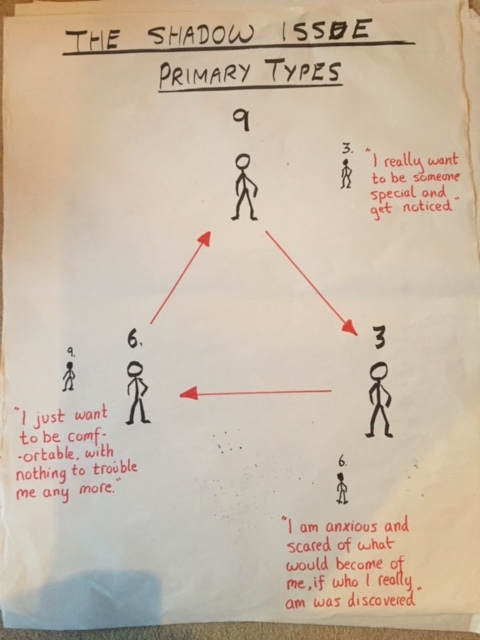 I think there is some real wisdom to be gleaned from the Enneagram about the corporate personalities of the UK and USA, which might help us to understand why the majority voted as they did and how we might want to understand and embrace our corporate mind-sets as we look to develop a positive politics of peace for the future. Richard Rohr has done some helpful work, as have others, on the personality types or dominant psyches of various nations. I agree with his perspective that Great Britain has a Type 6 personality and the USA is of Type 3. The root struggle for a type 6 personality is the need to be secure – therefore any campaign based on fear (of not having enough Sovereignty, of not having control of our money, of the “other” people who keep coming here and taking away our sense of national identity) touches on our deepest need and struggle. For a type 3 personality, the root struggle is the need to succeed and so the promise to ‘make America great again’ strikes the chord that tugs on the heart strings. So, focusing in on the UK (maybe some thoughts on the lovely USA another time), if we are to shift the political discourse towards something more healthy for the future, we need to learn to listen to the part of us that feels the need to be safe. We need to understand the ‘shadow’ part of our corporate personality that is anxious and fearful, admitting to ourselves what drives our thoughts and actions. When a Type 6 personality is not in a healthy place, they will begin to regress into a Type 3 pattern of thinking. So, the underlying drive to be safe becomes the need to get noticed and be special. So, post-brexit, some of which was about the need to be safe, we find our politicans trying to re-assert our Soverignty and our ‘Greatness’. Only a couple of weeks ago, Boris Johnson, the Foreign Secretary, was declaring on the radio that we don’t realise quite how the rest of the world sees us. Apparently, they admire us and think we need to continue showing great leadership in the world. We continue to believe this about ourselves, that we are very special and have a vital role which the rest of the world needs us to play. I wonder if we actually asked the rest of the world whether or not this is true, they might laugh in our face, pat us on the head and gently remind us that the world has moved on, but maybe we have not. Great Britain, as a Type 6 corporate personality, has an innate sense of loyalty. After the NHS, our Royal Family reamins the most popular part of our national identity, according to recent surveys. We carry a sense of being ‘loyal subjects’ who ‘do our duty for Queen and Country’. We are reliable, dependable, a safe pair of hands. But when our security is threatened, when we feel we are losing control, when we are told again and again that our borders are not safe, we begin to seek our security externally. We shut others out, we stop trusting others to make rules we don’t feel we have enough control over, build more weapons and ensure our finances work primarily for us. This then leads us towards a tendancy for workoholism, and so then we cut the nation state, drive people back into work, making an argument that it is the ‘lazy poor’ who are in part to blame for some of our mess. We become much more image conscious of our perceived role in the world and go on a charm offensive to remind people just how special we really are. But let me just state this: this is not a very healthy way to behave or live in the world. I know this isn’t going to sound ‘Great’, but it is my perspective that ‘Great Britain’ left the European Union out of a place of fear, which has drawn us to try and re-discover our ‘special’ place in the world. During the referendum, some of our deepest corporate insecurities were touched on, and rather than see them for what they are, speak to them comfortingly and confront them within ourselves, we were enticed into age old patterns of behaviour which acually prevent us becoming the true gift amongst nations that we could be. You see, in my opinion, the invitation to the UK was (and actually continues to be) this: Firstly, let’s admit it – we’re scared. There is too much going on in the world that makes us feel out of control. We need a sense of comfort and security and we’re not sure how to get that anymore, without shutting our borders and taking back control over our ‘own laws and money’. This is exactly why we need the friendship and help of our neighbours! Secondly, we need to hear the call to us that we are loved, actually (!) and we can therefore allow ourselves to be still and know that safety is not truly found in better barriers and bigger weapons but in the risk that is relationship, vulnerability and being known…..that somehow underneath everything are the ‘everlasting arms’. Thirdly, this allows us to find a new place in ‘just being’, knowing we have inherent value, becoming truly loayal friends to the rest of Europe and the World, without the need to re-establish our status as the ‘Great One’. Yes, the media holds an enormous amount of power, but it was the appeal to our deepest needs, a root struggles that enevitably lead to Brexit. Those, who felt the pull to remain, needed to speak to those very same issues, whilst calling us not towards our ‘3’ need to be Great and Successful, but towards our ‘9’. We must awaken the imagination of these amazing isles to a new place in the world, that is not about reassesrting our own name as Great, but finding our place as a nation of peace, building an altogether different kind of future in which our work does not look to protect our own future and rights, but the future hope of everyone everywhere. The UK has some incredible gifts and we can be a gift within and among the nations. We need a world in which each nation knows it’s inherent value and each can take their place amongst the nations to build a future for generations to come, in which we live in peace. We need to reimagine our place in the world. We need to tell a new and more ancient story. In order to do so we MUST face up to our own shadow, otherwise we will continue to act out of it and be the very antithesis of what we would, in our heart of heats, love to become.